US President Donald Trump has tweeted that “it is time to move forward in working constructively with Russia,” citing a ceasefire negotiated for southwest Syria as proof that this is possible. Donald Trump met with Russian President Vladimir Putin for more than two hours in Hamburg on Friday, the first day of the G20 summit. “We negotiated a ceasefire in parts of Syria which will save lives. Now it is time to move forward in working constructively with Russia!” Trump wrote on Twitter. Trump also tweeted that he and Russian President Vladimir Putin had discussed forming an impenetrable cybersecurity unit to prevent election hacking. “He [Putin] vehemently denied it. I’ve already given my opinion,” he said. Putin confirmed on Saturday that the accusations claiming Russia meddled in the US election had been addressed during his conversation with Trump. The Russian president reiterated that there is no reason to believe that Russia interfered in the US electoral process. “He [Trump] asked many questions on that subject. I answered those questions as best I could. I think he took it into consideration and agreed with me, but you should really ask him how he feels about it,” Putin said. 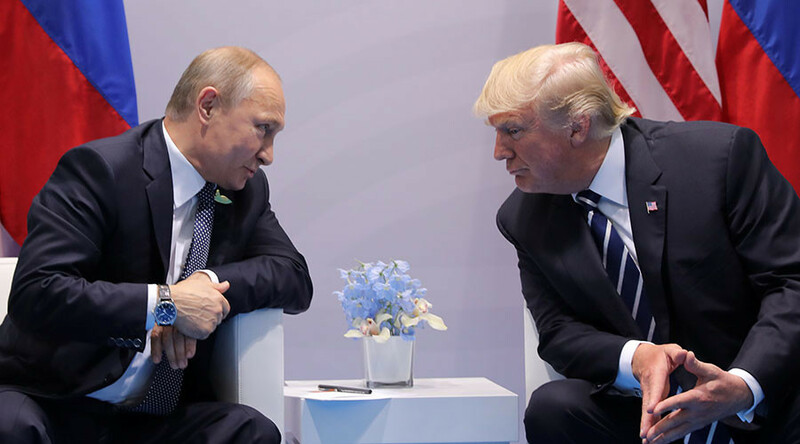 After their meeting at the G20, US and Russian officials announced that a ceasefire deal had been agreed upon for southwest Syria, to take effect on Sunday, July 9. The ceasefire applies to the Daraa, Quneitra, and As-Suwayda provinces. Trump said on Saturday that his meeting with Putin had been “tremendous.” Putin noted later that the Trump seen on television is different from the one in real life, adding that he felt relations between the two countries could at least be partially restored. “I think that if we continue building our relations like during our conversation yesterday, there are grounds to believe that we’ll be able to – at least partially – restore the level of cooperation that we need,” Putin said, addressing journalists. Donald Trump also tweeted that he hadn’t discussed the sanctions the West has imposed on Russia during his meeting with Putin at the G20. “Sanctions were not discussed at my meeting with President Putin,” he wrote, adding that “nothing will be done” until the Ukrainian and Syrian crises are resolved. The leaders also agreed to create a bilateral channel to promote a settlement for the crisis in Ukraine, Russian Foreign Minister Sergey Lavrov said on Friday. The sanctions issue was later raised by US Secretary of State Rex Tillerson, who arrived in Ukraine on Sunday for his first official visit. “The US and the EU sanctions on Russia will remain in place until Moscow reverses the actions that triggered these particular sanctions,” Tillerson said at a joint press conference with Ukrainian President Petro Poroshenko in Kiev.